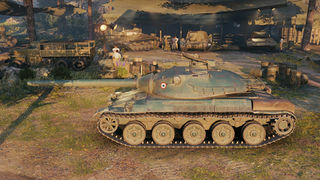 The AMX 30 1er prototype is a French tier 9 medium tank. The AMX 30 1er prototype leads to the AMX 30 B. This tank is all about making use of excellent speed and DPM. With 100% crew, rammer, vents, BiA and food you can reach in excess of 3400 DPM, which is outstanding. Enemies who are unfamiliar with your tank will often be shocked by your fast reload and 390 damage on average. When facing heavy targets, try to flank them at all times and make every shot count. Your penetration, although quite good, is not capable of reliably penetrating most heavies of your tier or higher from the front, so aim for weakspots, softer targets, or use excellent HEAT shell. Aim fully before shooting, since snapshots simply don't work on this tank - you will miss more often than not. Since your hull armor is weak, try to avoid engaging enemies head-on in the open, unless you have more HP or can quickly finish them with your DPM. Your cupola can sometimes bounce, so hulldown positions with peeking and retreating are actually viable (your gun depression is good), and you can also quickly relocate when required. Your main weakness is a weak ammo rack which gets damaged quite often, so get safe stowage perk for your crew and bring repair kits, and, of course, try to avoid getting shot in the first place. The other weakness is that this tanks really likes to burn. A LOT. So much in fact, that not only automatic fire extinguisher is highly recommended, but even getting a 2nd fire estinguisher (manual) is not a bad idea at all. You will be thankful for it many times. When stock, the AMX 30 Prototype is a pain. 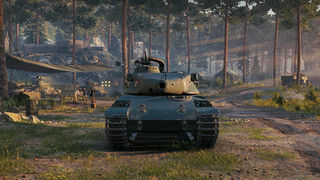 Although the mobility is still fairly good, the gun is only really effective for flank shots or even rear shots for some of the more heavily armored tanks in the game. However the stock mobility is good enough to reach these required positions. Researching the 100 mm SA47 should be a main priority. Note that the gun is too heavy to be initially mounted so the tracks should be researched or Enhanced Suspension mounted (it is cheap anyway). The final gun, the 105 mm mle. F1, is an excellent addition to this tank. It combines acceptable penetration (248mm) with good alpha and outstanding rate of fire to make the AMX 30 Prototype a medium with a nasty punch for unsuspecting enemies. If you have free XP to unlock the tracks, do so. If not, mount enhanced suspension, it is cheap and will allow faster progress to the 2nd gun if you don't already have it unlocked. Mobility with stock tracks and engine is very good anyway, so the firepower should be your priority. Research and mount the 100 mm SA47 gun for a much needed boost in penetration and damage. 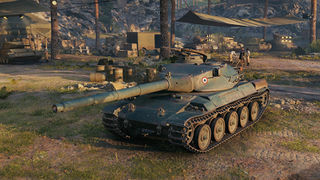 If you played through AMX 50 100 or Bat.-Châtillon 25 t AP, you should have this gun readily available. This page was last modified on 2 November 2018, at 09:59.